Ever since I accepted design thinking as my personal business savior, I feel the urge to share my knowledge and its teachings with others (well, I’m also a teacher at heart, so there you go), and I did precisely that at this event, with a smile on my face when the participants had fun! The idea of brainstorming is not new but somehow was usually reduced to a general “grab a pack of stickies and write whatever” scrimmage, with no agenda nor general goal. Therefore, ever since I became aware of the benefits of a structured brainstorming, I did research and studied the rules and regulations to make sure I and my participants/colleagues would always get the best of the session. The workshop delivered as part of the Innovator’s Summit creative conference was explicitly focused on that. On this workshop, the topic didn’t matter, none of the other stages of design thinking mattered. It was just brainstorming, but doing it right! I presented the rules, explained them in detail and (gently) enforced. Enforced with closed captions, because whenever one of the participants broke a rule, I would point out how it affected the others individually, how it influenced the group dynamic, and how it could influence the results of the session. Now, in 2018, I must admit that I’ve had a fair share of (unsuccessful) brainstorming sessions myself that made me quite an advocate against them. 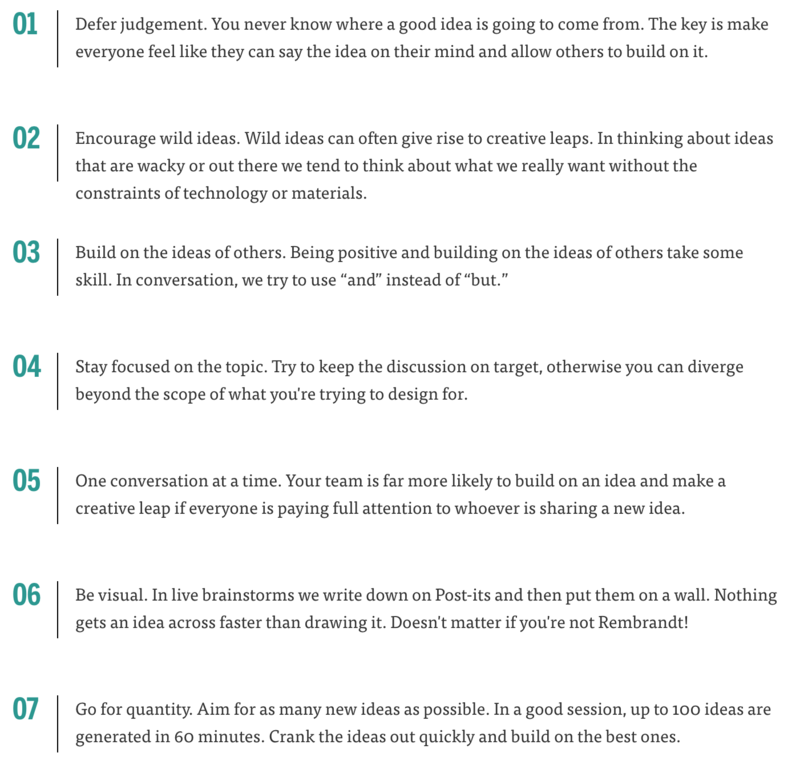 If you are curious as to why I now think that brainstorming is not the greatest, click here to find out. However, remember that to break the rules, you need to know the rules!